Busch Gardens Tampa Bay opened on March 31, 1959, and has an African theme. The park was originally tagged "The Dark Continent." The theme park is one of America's largest zoological institutions, with more than 2,700 animals. Attractions include: Rhino Rally, Montu, Kumba, Scorpion, Gwazi, Edge of Africa, Jungala, Sand Serpent, Congo River Rapids, Tanganyika Tidal Wave, Stanley Falls, Serengeti Railway, Phoenix, also a new Sesame Street, and SheiKra also a new roller coaster called "Cheetah Hunt" and a new cheetah enclosure, a vertical dive coaster which opened in 2005. The theme park is some distance away from downtown, in central Tampa, near the limits of the City of Temple Terrace to the east of Tampa. 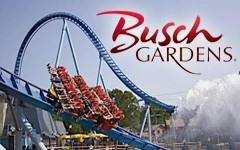 Busch Gardens Williamsburg opened May 5, 1975. With its European theme, the park was originally tagged "The Old Country." Attractions at this park include The Curse of DarKastle, Alpengeist, Escape from Pompeii, Apollo's Chariot, Loch Ness Monster, and Griffon. Added in 2007, the Griffon coaster has bragging rights as the tallest dive coaster in the U.S. The park is divided into seven sections, each themed to a different European country. On July 25, 2009, Busch Gardens announced that the Big Bad Wolf roller coaster would be retired September 7, 2009, after 25 years of operation due to its "meeting the end of its service life." and will be replaced with a New Multiple Launch Coaster that is set to open in 2012. Newly added in 2009 was "Christmas Town," A Christmas Celebration, with many themed holiday attractions and shows with 5 million lights and a 50' Light Animated Christmas Tree. Also in 2010, the 3-D ride Corkscrew Hill was replaced by Europe in the Air. Also New for 2010 was illumiNights: A Busch Garden Encore, with many Mini nightly country shows and nightly fireworks set to a special soundtrack which is available during the special event in many gift shops. In 2010, Busch Gardens announced a drop tower called the Mäch Tower which was set to open in late Spring 2011 but was delayed due to train problems from Italy and opened in August 2011. On September 17, 2011, more information was given on the new multi-launching roller coaster called Verbolten that will open in spring of 2012 in the old Big Bad Wolf location.